McLain Ward and Sapphire Triumph in $100,000 President's Cup Grand. Kids&rsquo; Day Comes to the Washington International Horse Show Saturday, Oct. 30, with free pony rides, arts and crafts, special guests and more! 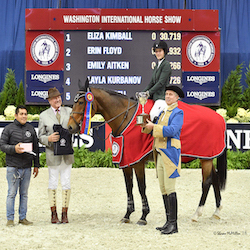 Anna Rossi, of washington, DC, is named 2010 WIHS Youth Ambassador. Purcellville, Va., resident brings more than dozen years of sales experience in the horse industry to advertising and sponsorship role at WIHS.